Romania is the place to be! Now, I can’t comment the nobility of Noble chafer, Gnorimus nobilis, (Family Scarabaeidae) and whether it belongs to a hereditary class with high political or social status. However I can confirm that the Noble chafer has high principles and ideals when it comes to choosing its natural environment and home, traditionally managed orchards and woodlands. The Noble chafer can often be found in traditionally maintained cultural landscapes and develops in decaying wood within the hallows of live trees throughout Europe. The adults emerge in early summer and live for 4-6 weeks dining on high nectar flowers such as hogweed, elder, and meadowsweet. Unfortunately, over the last century these beetles have been losing their habitat due to the rural to urban human exodus, urbanization, and rural development programs (Hartel et al. 2013) and consequently have become rare in parts of Europe, such as Great Britain; (Hampshire Biodiversity Partnership). However, in Romania, many people still practice traditional land practices such as manual hay mowing, tree pollarding, low intensity grazing. These practices create a mosaic of habitats in which many species, including the Noble Chafer, thrive. So, these beetles still seem to be abundant in Romania…. at least for now. 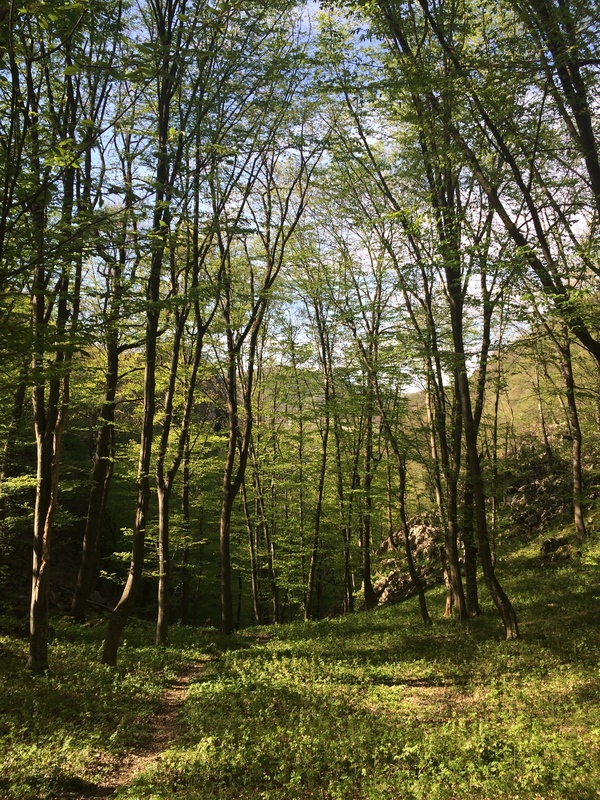 I discovered the Noble chafers while surveying longicorn beetles using pheromone trapping in a sub-Mediterranean forest of the Iron Gates Natural Park in Southwest Romania, as part of the Romanian Beetle Project. At first, I thought it was a fluke! I figured the first Noble chafer captured must have been merrily going about its daily business and accidentally flown (undamaged) into my trap. Oops! But then I continued to find Noble chafers throughout the month and a half of our trapping expedition. In total, we captured 24 Nobel Chafers! The Noble chafer is a beautiful metallic green beetle (approximately 2cm or, if you are American, Liberian or Burmese that is 3/4 inches in length). But the most telling feature to identify these beetles is their scutellum, which is the small triangular shield-like structure between their hardened wings (elytra). Noble chafers have a scutellum that is shaped like an equilateral triangle (all three sides are equal). 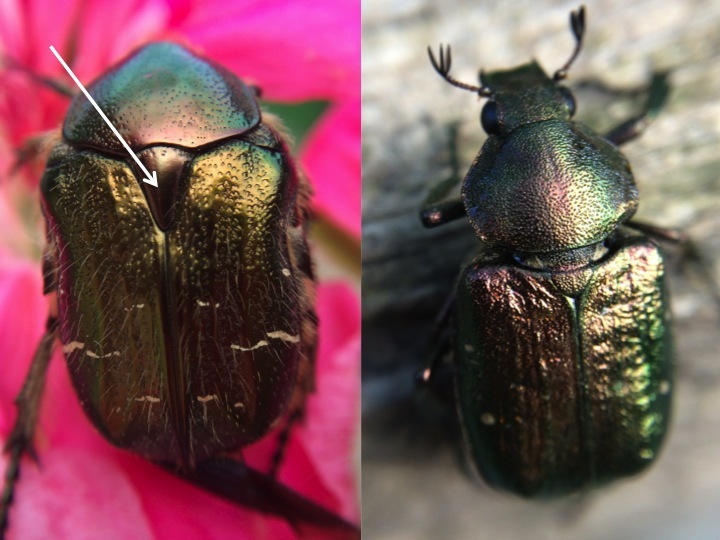 But be careful when making the identification because they can be easily confused with the Rose chafer, Cetonia spp., (Family Scarabaeidae) which have an isosceles triangle (2 out of the three sides are equal) shaped scutellum. The Rose Chaffer is similar to the Noble Chaffer with the exception that its scutellem is shaped like an isoseles triangle. The Noble beetle is rare and has a scutelum shaped like a equalateral triangle. I needed to learn more about the Noble chafer, if scientists were working with it and what conservation initiatives were being taken… So, I contacted The Peoples Trust for Endangered Species. It is an UK-based organization that bridges that gap between science and real-life conservation initiatives. They consider this beetle vulnerable in the UK, which means that is at high risk of extinction. I told them about all the Noble beetles I captured in Romania and they immediately put me in touch with Dr. Deborah Harvey. 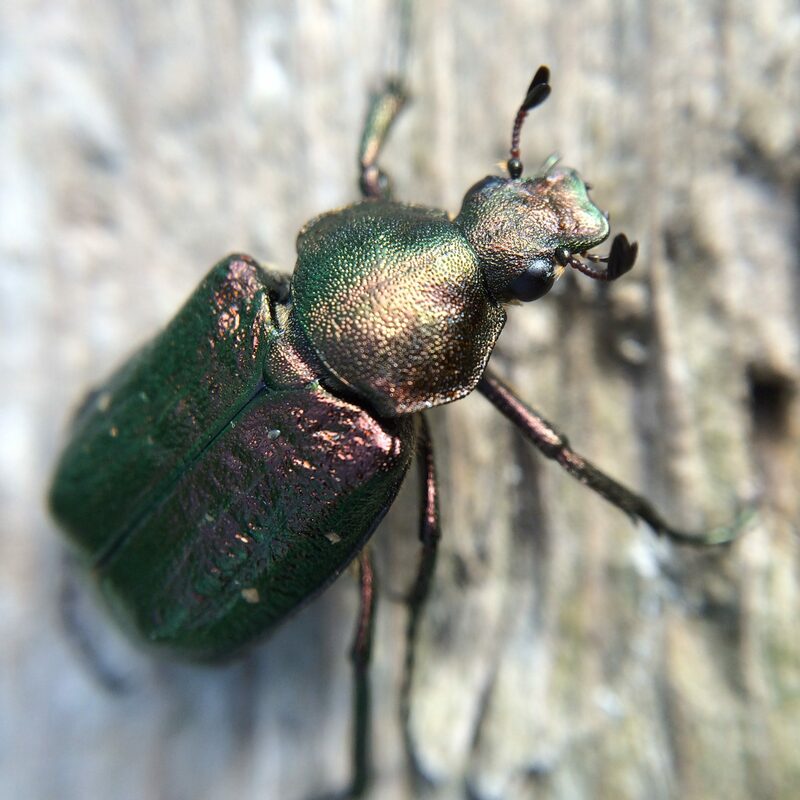 Dr. Harvey is a Post Doctorate at the Royal Holloway University of London and has been working on the Noble beetle as part of a wider project in conjunction with the Universities of Birmingham and Aberstwyth, funded by Leverhulme. She is investigating the use of pheromone attractants to manage, survey, and ultimately conserve the Noble chafers. So, she was obviously intrigued and excited to hear about my discovery (and especially to learn about the pheromones I am using)! In essence, pheromones have been “playing with insects heads since the 1950’s” when they were first applied to control moth pests. A pheromone is a chemical compound produced by an organism that sends a signal or message to a member (or members) of the same species, causing a change in their behaviour. In this case, we hope that a pheromone will attract Noble chafers looking for romance (a potential mate)! Similar to the Romanian Beetle Project with longicorns, a pheromone would help conservationists survey and monitor the number of Noble chafers (without harming them) and inform about their community and ecology. Dr. Harvey is an Insect Conservationist and has been working with Noble chafers (among other vulnerable beetles) for a few years now. In addition trying to find pheromones for attracting adult Noble chafers, she will also be studying the larvae (baby beetles). She explained that in the UK the current method for identifying the presence of chafers is to look for signs of larval frass (beetle poop!). The larvae develop in decaying wood and probably feed on fungi. But that’s the thing… we do not know exactly what they are eating or how they develop. And the frass could have been there for a really long time after the beetles have left the tree. So, in fact, frass may not actually be the best method for determining if beetles are really there. …And this is where Dr. Harvey comes in, she will be conducting scientific experiments to learn how the larva develop, what they eat, and the kind of natural home environment they prefer. With knowledge on the Noble beetles biology and ecology, we can better identify and safeguard Noble chafers habitat. I always tell people that Romania is the “wild wild west”… of Eastern Europe! It is one of the few European countries with intact wild forests with a diverse array of ecosystems. And it is because of this that it is home to many species that cannot be found anywhere else in Europe and many of them are threatened or are in danger of becoming extinct. So, it was no surprise that it would be home to Noble chafers but whether or not they prefer Romania? …Well, we will have to wait and see if Dr. Harvey and I have stumbled upon a pheromone to find out for sure! Hartel, T., Dorresteijn, I., Klein, C., Máthé, O., Moga, C.I., Öllerer, K., Roellig, M., von Wehrden, H., Fischer, J. (2013): Wood-pastures from a traditional rural region of Eastern Europe: characteristics, biodiversity and threats. Biological Conservation, 166: 267-275. Noble Chafer, Gnorimus nobilis: Species Action Plan (2001) Hampshire Biodiversity Partnership. 2: 1-6. This entry was posted in RO Beetle Project Stories on May 20, 2016 by Bekka Brodie.